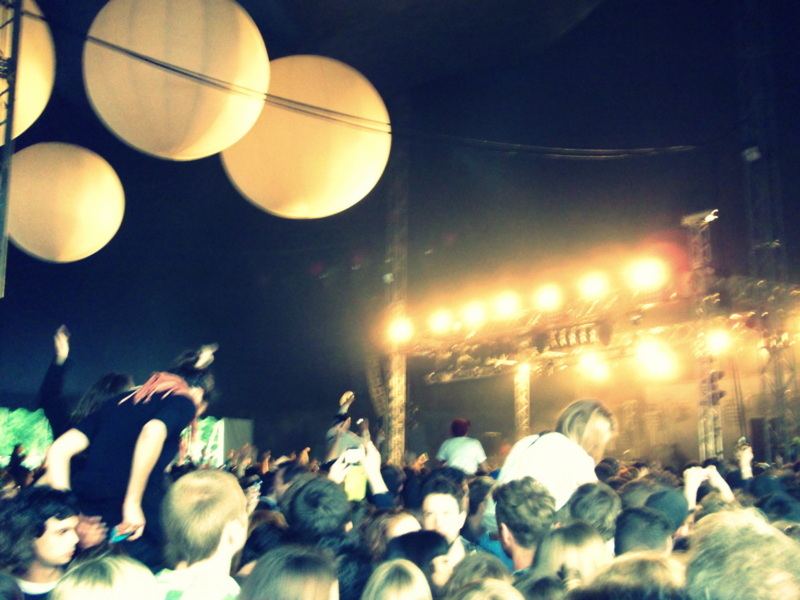 The festival season officially kicked off with Field Day festival on 2nd June. Now in its sixth year, the alternative festival, known for its selection of fresh, under the radar music, did not fail to deliver. 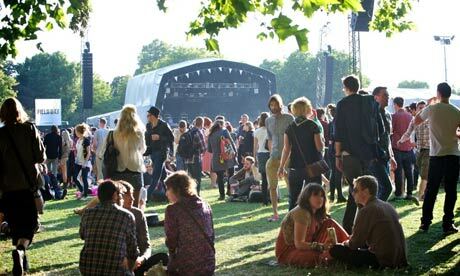 Around 20,000 festival goers turned up at Victoria Park for their dose of folk, indie, electro and rock. Not only was this my first time at Field Day, but my first ever festival! I thought I’d start off by avoiding the whole muddy camping malarkey with this one day festival. I unfortunately couldn’t escape the typical British weather when it tipped it down at the end of the day. Before the weather took its toll, the festival was everything I expected it would be – thousands of festival goers all trying to squeeze into a tent, copious amounts of fast food and a music line up that left us spoilt for choice. It was quite overcast most of the day, until mid afternoon when people literally rejoiced when the sun came out. 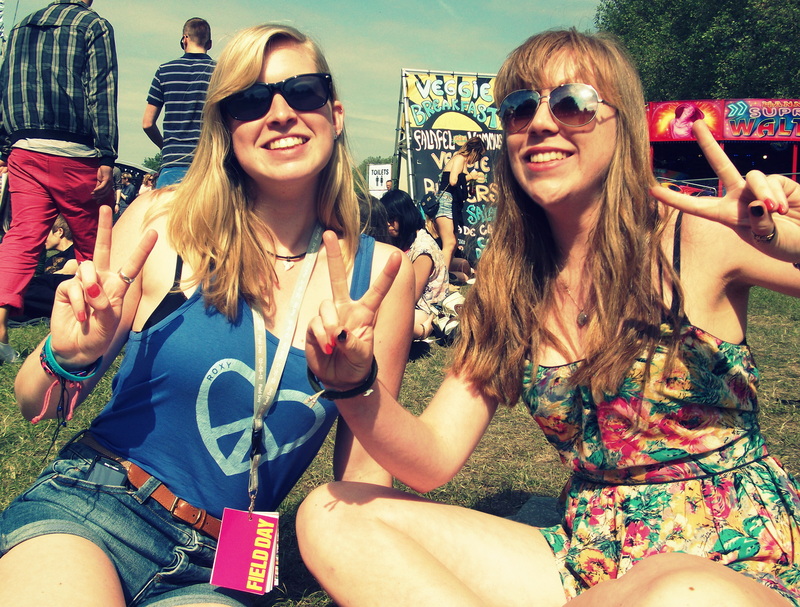 It’s amazing how the weather can affect a festival atmosphere, suddenly everything seemed just right as we snacked on nachos and bathed in the June sunshine. In celebration of the Jubilee, there was even an appearance from Queenie herself who hosted the Field Day Derby. OK it was just an actress in a mask, but she gave an entertaining impression as she called out ‘Would anybody like to volunteer for the horse’s arse?’ Participants dressed in two man horse costumes and ran an assault course, posing a great challenge to the contestants, to our amusement. After dipping in and out of tents to witness bands we’d never heard of, we carefully planned our musical route to make sure we saw our favourite artists. Our first point of call was the Red Bull stage where Jessie Ware, known for collaborating with Joker and SBTRKT, gave an excellent performance of 110%. Andrew Bird mesmerized the crowd with his fiddle-playing, whistling and dulcet tones over at the Eat Your Own Ears main stage. We stayed put at the open air main stage to listen to the likes of Metronomy, a quirky electronic four piece who were on form with their staccato, synthed-out melodies, reminiscent of old video game timbres. 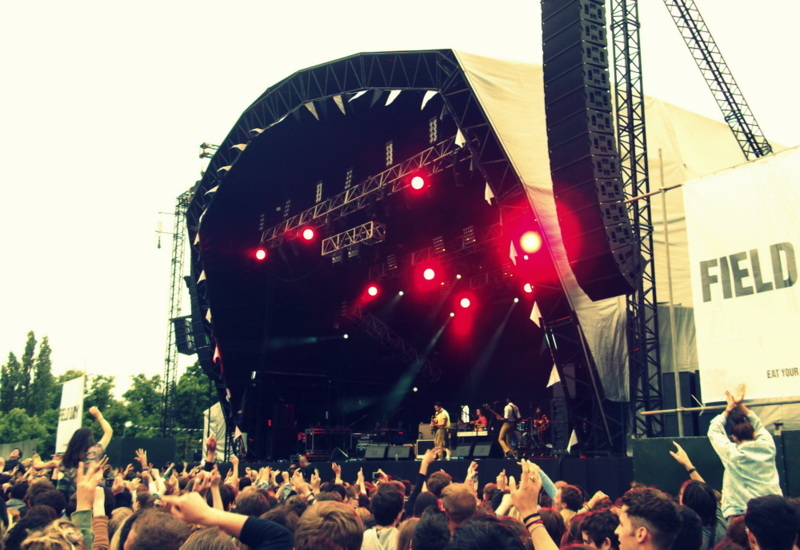 We then made our way over to the Bugged Out tent to see my most anticipated act, SBTRKT. Here, however I encountered the violent force of the festival. The tent was definitely not big enough to accommodate the hordes of electro lovers. People just had to be in the thick of it so pushed and shoved their way past us to catch a glimpse of the enigmatic musician. When SBTRKT, aka Aaron Jerome, graced the stage, everyone went crazy. That was until he managed to blow the speakers and was subject to booing. The sound system obviously couldn’t handle the dirty bass. After the technical difficulties were resolved, SBTRKT played an excellent set, including my favourite song of the day, Wildfire. This amazingly catchy and funky dubstep track definitely made up for the lack of being able to move! The most surreal experience of the day occurred when we were navigating our way across the festival, past the main stage where Beirut was performing. At the back of the crowd we were met by dozens of people gracefully skipping around in circles to the whimsical gypsy-folk tunes. It felt like we had stumbled into celebratory dance in the Shire, which we quickly become a part of. Bit of a contrast to the typical concert bopping and raving. We eventually made it to The Laneway stage for The Vaccines, who did not disappoint. The indie rock band seem to be omnipresent at the moment with the success of their debut album, What Did You Expect From The Vaccines? The band has definitely improved since I saw them first at the NME Awards tour last year and there’s no denying they have many dedicated fans, who sung along to every word of their infectious songs. In true British festival style, it started to pour down for the headline performance. We managed to catch a few Franz Ferdinand songs before deciding to beat the crowds and get the hell out of there before it got any worse. We got off easy. I don’t know how some people manage to withstand the rain during whole sets, only to have to trudge through mud to camp in a soggy tent. Hats off to you guys.